The nickel-sized flowers appeared like fuzzy spheres with numerous stamens poking out so they looked liked starbursts or maybe tiny little fireworks. How appropriate since I was taking this walk on the 4th of July! These flowers can be called apetalous, meaning without petals. Leaves were sparse on the upper reaches of the plant, but lower on the stalk there were more of them. 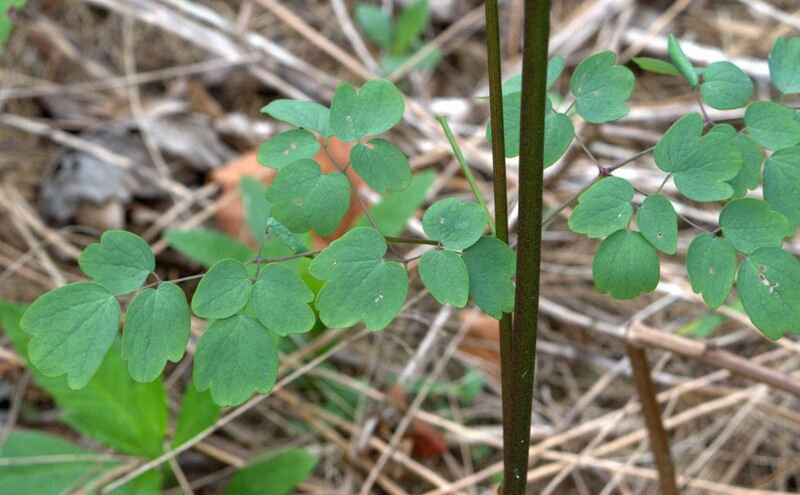 Immediately, I thought of the foliage of Rue Anemone when I saw the three rounded leaflets in the subdivided compound leaves. Tall Meadow-Rue, Thalictrum polygamum, is a member of the Buttercup Family, Ranunculaceae that blooms from July to September. 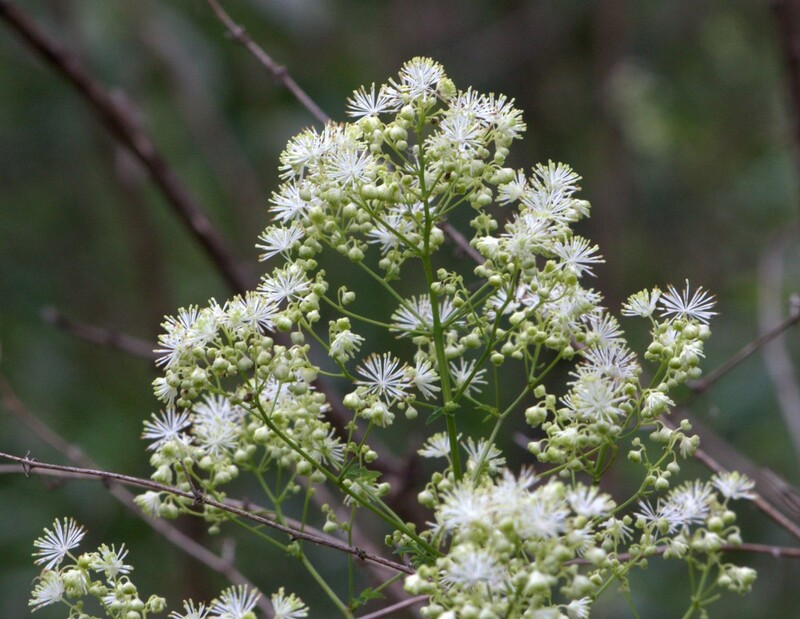 It’s growing near Little Buffalo Creek in this case, but you can find it blooming in swamps and wetlands. This summer-flowering plant will grow to 8 feet tall, hence the name. The tallest specimens that I found were leaning over onto their cohorts, like the daylily and thorny berry shrubs. By the way I ate 3 black raspberries and saw that a few blackberry plants had green fruits yet. These brambles were located between the spillway of the creek and the forest along the Mill Race Trail. 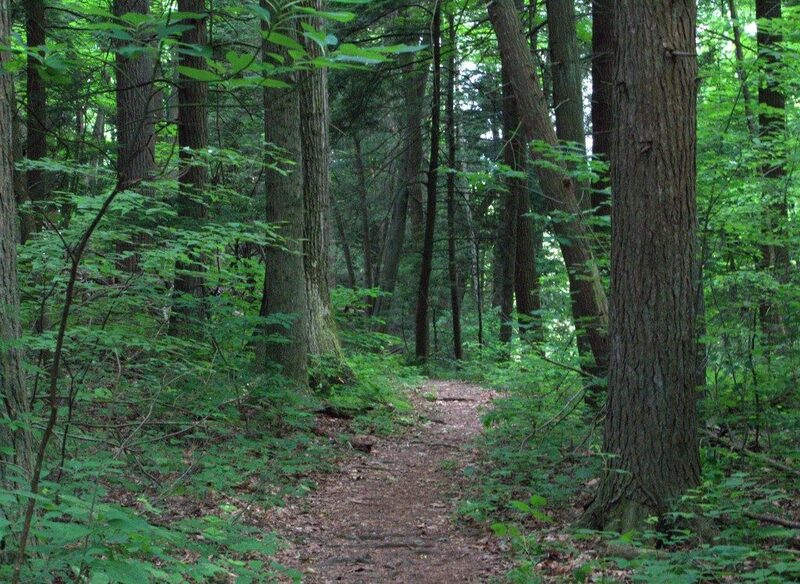 I don’t know why I think it’s fun to have a nibble on the trail, but I do. That’s right, be a kid. Life is too short! Other flowering plants included the Enchanter’s Nightshade, Touch-Me-Nots – both yellow and spotted species, Water hemlock, and Thimbleweed. Each was blooming along the trail where more sunlight reached the plants. 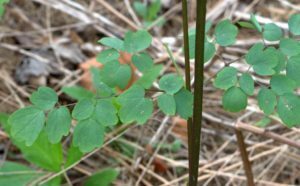 As I was attempting to photo the first tall meadow-rue that I saw I moved a plant out of the way only to discover too late that it was poison ivy that I had just touched. Oh! Way to break Rule #3: “Always look for poison ivy!” Dang it! So I took the photo anyway and immediately went to a more sunny area looking for touch-me-not or jewelweed plants. I was delighted to have found one where I thanked it for lending me the large leaf I snatched from it. I took a moment to scrub my hand that moved the PI with the jewelweed leaf until I could feel its juices. Then I went on my merry way! Didn’t come down with the itch later — thank Goodness it worked. The posies of the Spring have vanished, yet some of their greenery remains in spots. Bloodroot, wild ginger, violets and coltsfoot still have green leaves above ground. So, are these plants really categorized as Spring Ephemerals? I suppose so as the seed heads weren’t visible save one fuzzy coltsfoot. As I drove home I tried to name all the roadside flowers as I passed them. Too many to count, but I’m sure there were more than a dozen different kinds. You’ve seen these common plants, like the light blue chicory, yellow sweet clover, white and yellow oxeye daisy, the orange daylilies, bright yellow trefoils, and others. Better than the license plate game, huh! Just be careful to stick with Rule #5: Always keep one eye on the road! I was looking at a plant that you called ground cherry / husk tomato, it looks like one I have grown which is called a cape gooseberry. Are they the same plant? Yes, Lily. The plant we call ground cherry or husk tomato is also called the Cape Gooseberry! Do you still grow it? If you want to read more about it, here’s the main link for Ground Cherries or Cape Gooseberries.